Hello, here we meet again! I hope everyone had a lovely weekend. If you are interested in starting a price book and missed my post about it last week you can read about it here. Also don’t miss out on the giveaway I have going on right now. Menu Plan Monday guidelines and banners can be found here. Crispy chicken hits the spot right now – YUMMY! I’m going to try that chicken! Oh the crispy baked chicken sounds delicious :)that would be perfect for a park picnic I bet.Thanks for hosting. Have a great week. I really loved it cold the next day as well so yes it would definitely be great for a picnic! Wow, that SW Layered Salad looks so good but I have to know, where did you get the baking stone? (Yes, it’s all about the gadgets!) Your week looks yummy and fun. Very cool that your daughter cooks. I have just started talking to my eldest son about how it is almost time for him learning to cook a simple evening meal. Mmmmm. Looks great. By the way, I signed up for the TOH weekly menu for some added inspiration – thanks for the tip! Wow – that Southwest Layered Salad looks soooo good! I know I would like it! I am glad you posted the layered salad picture. It seems strange for those of use downunder, or me in particular, but I would definitely eat that one! Yum. Hi! The salad looks delicious. We’ve been having a lot of food like that lately also. It’s been in the 90’s here/ AC on, and everything feels like we’re living in a greenhouse. Hey, I designed a little organizer that almost anyone can make. The link is on my menu plan post. Thanks! Your menus always sound so easy and so delicious. The mushroom quesadillas sound SO good, but only me and Hubby would eat them – everyone else would say, “ewwww!” Of course, that means more for me! Hmmm, I might be on to something! 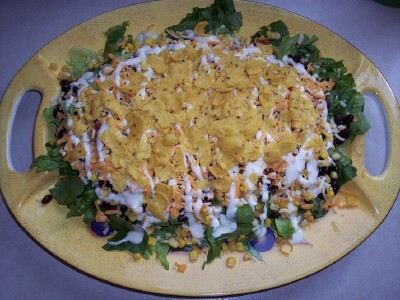 The Southwestern salad looks good! I may have to rethink my meal plan for the week!!! Another vote for the layered salad, looks delicious! Yumm! It all looks great! The Layered Salad looks yummy. I will post my plan on Monday. I am not as ready as all of you post one day ahead types! I’ve got to try that Thai Crockpot chicken! We love thai food and I am picking up my order of chickens from the farm this week, so need inspiring recipes! Hi Laura! I hope your summer is going well! That taco salad looks DELISH! We actually have taco salad about once a week – build your own. Everyone likes different stuff on it. No menu plan for me this week! Boo hoo! My twins are out of state, the oldest step daughter is working a lot, and my husband is convinced he wants to do low carb all week, so I have nothing to plan! This was my first post on Menu Plan Monday and I hope to post many…many more in the future. Thank you for hosting! Thanks as always for hosting. Your menu looks fun and I am going to adopt your “if you can find it you can eat it” night – too funny! That salad looks yummy and easy! I actually have everything I need for it. It would make a great covered dish supper take along. Thanks for linking the recipe! mmmm . . sometimes I really miss cheese. Beautiful salad and great looking menu! I can’t wait to try the kid-pleasing spaghetti and the thai chicken. They both sound really yummy to me. Thanks for posting. Thank you for posting that delicious looking salad! It will likely be on our menu for next week. This is my first time posting, so I kept things pretty basic this week. That salad looks fantastic! I may have to try that next week. We are doing a total kitchen remodel, so my cooking capabilities are some-what limited. Plus, who wants to actually cook during the summer? I am so on it and doing the menu planning today! I am tired of guessing each day what to have for dinner and will be going with a full week in mind, except for the weekend, that is for my husband to cook and me to relax, yea! So off I go, wish me luck and I will be a regular here! The salad looks delicious. I made a similar salad a few weeks ago and posted on my blog. It is different, but same idea. I love making salads during the summertime. That recipe looks great! It looks like a easy, fun recipe for summer. Thanks for sharing! I am new to your Menu Planning Monday, but have enjoyed being so organized! It really helps with the “wondering whats for dinner” problem. Crispy Baked Chicken is one of my favorite things! A newbie here! Fantastic idea for sharing meal plans. I’m always looking for new inspiration. The layered dip looks great! I love the idea of this and I am looking forward to finding some great new recipes on all the links. Thanks to all for sharing your menus. I love this site! I am so glad that I put that 5 Minute Southwest Salad on my menu last week! It was SO fast and SO yummy! Even my husband LOVED it! 🙂 I just love a good salad recipe like this one! Fast and yummy! mmm….I love looking at your weekly recipes! Thanks for the inspiration! 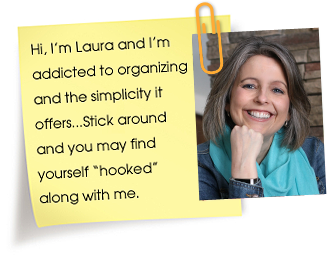 Laura, I’m curious…how old is your daughter who is cooking one meal a week? That’s awesome! I hope you enjoyed the pasta last week! Menu plan looks great…. my is on the way to being finished. Maybe by tonight! Thanks a bunch! This is fun. I love finding new blogs this way. I’ll give crispy chicken a try! I hope my menu is OK I cook pretty plain things. Just leaving a comment! I added myself! First week so I’m not sure if I did that great but oh well! Practice makes perfect! Thanks so much for a dinner salad recipe. I am collecting these for the hot spells we have once in awhile. Pray we get a refrigerator before Friday! MMM, yummy. That salad looks great! I hope you like that chicken. Now I feel nervous. LOL. I know we really enjoyed it though and someone left me a comment that you can also use pork tenderloin instead of the chicken. Yum. I’m so excited to have found you! I love to menu-plan and try new recipes, so this looks like the place to be. Thank you!! We’re enjoying your last week’s menu so much this week I may just do yours again next week! No menu this week, but I am definitely going to be trying out that salad! I have been too busy organizing my work room to get a menu together LOL! Oh yum! I’m going to check out some of the links you provided and test some out! I love everyone’s creativity and ideas! Thank you all so much! I am new so I hope I can give each and every one of you half as much back.